Often underrated and underused in our professional opinions, shelves are the perfect solution for saving space on the tables and floors throughout your home. They aren’t only an affordable option for most homeowners, but they also are easy to assemble and install yourself! 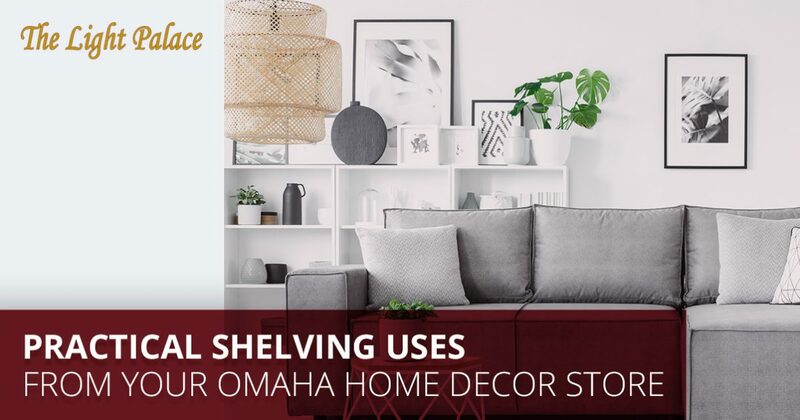 In today’s blog post, we’ll go over some practical uses for shelves and how you can implement those uses in your Omaha home. The Light Palace is a home decor store in Omaha that offers an array of lighting and home decor products to the local community. Whether you’re in the market for some shelves or new indoor lighting fixtures, we’ve got something for everyone in our huge selection. Visit our home decor store today for more information. There are several practical, functional and beautiful uses for shelving. Below, we’ve listed seven of many of our favorite practical shelving uses for your Omaha home. For pots of your plants. It’s very trendy these days to place plants throughout your home. Though potted plants make for great home decorations, they oftentimes can take up valuable floor or window sill space. For your workspaces. You’ll be amazed at how much easier your workflow will be when your desk is free of clutter. Install a shelf above your workspace to place things you don’t use often so you can keep your desk clear! As bathroom storage. Install a “floating” shelf above your toilet or elsewhere in your bathroom to store extra towels, toilet paper rolls, cleaning supplies, etc. As a “command central.” You can install a shelf near your front door or your mudroom as a place to hang your coats, keys, hats, dog leash, etc. This is a perfect organization solution so you know where everything is before you leave your home, meaning you’ll never have to spend hours looking for your keys again. As a display for your goods and home accents. If you have valuable items you want to show off in your home, save wall and floor space by installing shelves to place these items on. At The Light Palace, we offer more than just lighting. Sure, you can find one of the largest selections of lighting products in the community in our lighting showroom, but we’re also proud to be one of the most trusted home decor stores in Omaha. Ranging from furniture to home accents, our home decor store is bound to have whatever you may be looking for. Whether you’re searching for shelving for your home or brand new outdoor lights before winter hits, our lighting experts can help you find exactly what you need — all while staying within your preferred budget. We’ve been connecting individuals with their optimal lighting and home decor products since 1953, and we continue to grow and build trust with homeowners in the community every single day. Stop by our home decor store today to see our home accents, furniture and light fixtures in person. Keep in mind that we will be closed Thursday and Friday of this week in observance of Thanksgiving! Have a great holiday, and we hope to see you in our lighting showroom soon.